Rangers' James Tavernier celebrates scoring his side's third goal from the penalty spot. Photo credit: Jane Barlow/PA Wire. A first Premiership away win for Steven Gerrard and Rangers – but the 4-1 defeat of Hamilton Accies on Sunday afternoon was not one that the Ibrox Boss was best pleased with. Gerrard was delighted to pick up the three points, but he was not happy with the performance. He said: “I was obviously very pleased with both the result and the three points. All the talk before the game was about our away form – we hadn’t won all season in the League – but I wasn’t too pleased with the performance in all honesty. “I think we were frightened when they equalised. Their goal gave us the rocket that we needed. At 1-0 we were too casual and I didn’t feel comfortable. I always felt they would get one opportunity that might have been costly. The equaliser jolted us back to life. “I think 4-1 flatters us – but we were comfortable in the end. “We played better at Aberdeen and Motherwell but still dropped points. As a manager sometimes you’ve got to accept that it won’t always look great. We were sensational against Hearts and Rapid but it’s never going to be like that all the time. The sign of a good team is to win a game when you’re not performing to your maximum. 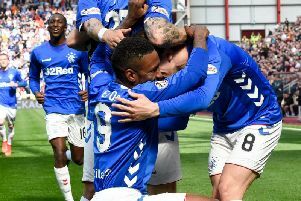 There was praise for Light Blue Captain James Tavernier, whose two late penalties clinched all three points for the visitors, making it seven out of seven from the spot for the season. The Rangers manager was delighted to welcome the return of Jordan Rossiter, making his first start of the season. For Rossiter himself it has been a long, hard struggle – and he could not hide his relief at being involved again from the start. “It was an unbelievable feeling to be back playing, it’s been a very tough time for me this year but the gaffer has put his faith in me and I just want to start paying him back,” he said. “To be honest I have a long way to go in terms of getting back to fitness. There is a lot of competition for places which is great and I’m just happy to be back involved and three points is always a bonus.